"Charismatic, connected and athletic, our goal was to create a design that’s emotional and sporty yet with a sense of timelessness and sporty." 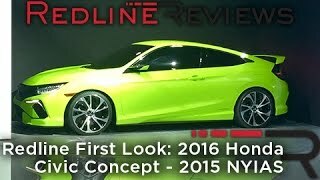 Said the Chief exterior designer of this newly released Honda Civic Concept car 2015. 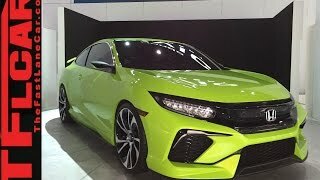 Well his words well portray the commitment and expectations team had in their mind and heart while preparing this amorous Honda City neon green Concept car 2015. Till date not much has been talked about the specification of this new Honda city concept car but all what has been shared is its 1.5 liter turbocharged direct injection engine coupled with 6 speed short shift transmission. Looking at this concept presumptions round up expecting the return of Civic Si. The launch of Si made a good stand in market and gathered commendable number of eyeballs, even of those who are not much into the sports car segment and the reason could somewhere be the Sporty look with the interior waging the luxurious mould of it. The sporty aggressive face is highlighted by bright LED head lights adorning the Flying H Honda grille, supported by the deeply sculpted lower air intakes and indeed making it more captivating. The company here claims that the interior, Exterior and the Engine together makes the new Honda Civic Concept beyond the targets of Efficiency, performance, safety and productivity. With all these and the concept so portrayed at the 2015 New York motor show, the car lovers and especially the Honda followers are anxious for this particular manufacture by team. 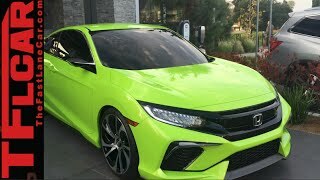 We do not have much to talk about the Engine as of now apart from points we have shared above but yes as for Interiors and Exterior let us take a closer look of 2015 Honda Civic Concept car. 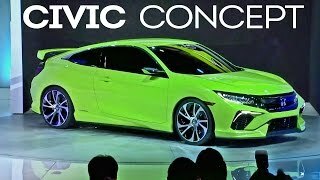 The Interior just like the Engine description is more of sketchy but yes notable improvement is definitely expected in the interiors of 2015 Honda Civic Concept car. The amenities like adaptive cruise control, lane departure warning, the back up camera and lane watch side view monitor, that debuted with the company’s previous launch accord are expected to be part of this model too. The lower and wider exterior is definitely captivating. The Full width LED tail lights, spoiler and the center exit exhaust will definitely add to the looks of this new concept car. Upon wheel you can easily notice the athletic sculpting and a prominent arch. In fact the appreciations say that the 10th Generation Civic, showing the complex front end with a deep fascia and huge air intakes holding a bolder new Honda’s family look. 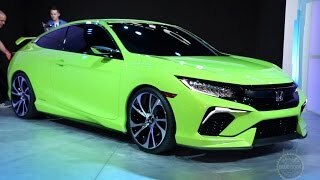 Now getting through the available information let us see as to which cars in market might turn to raise the competition for this new Honda Civic 2015 Concept car. Lined up in the queue are Mazda3 and Volkswagen Golf, which are expected to raise the competition and can bring the thought of comparison and choice in the minds of car buyers.